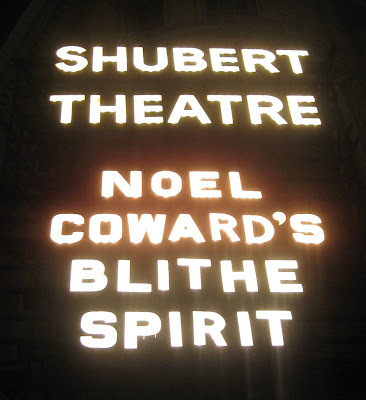 Noah, Kari, Kevin, Roxie and I took in the last performance of Blithe Spirit at the Shubert today. Noah and I sat in Row F on the aisle. We were just a couple of rows behind Bernadette Peters, which was a bonus for us since it was at the Shubert where Noah and I first met at Bernadette's last performance of Gypsy on May 30, 2004. Blithe Spirit was the light champagne in a season full of wonderful plays, plus it provided the 5th Tony for Angela Lansbury for her hilarious turn as Madame Arcati. I was there for the first preview, Opening Night, the first Tuesday after the Tonys and today, and of course I threw in a few extras for good measure. I met some new friends along the way - from Maine, Wisconsin and Texas - and discovered the work of the wonderful Jayne Atkinson. I'll miss those clever Coward lines that provided us so many inside jokes over the spring and summer. I'll miss seeing Christine Ebersole in that beautiful wig and dress. I'll miss Jayne Atkinson looking like Helen Mirren and saying "that cheesy thing" and being so fabulous. Most of all, I'll miss seeing Angela on stage. I'll just miss it all. I wish I could have had the pleasure of seeing the last Blithe Spirit with you! Although I WAS there, that night of June 27th, the night you and I and my father had dinner and saw the evening show! I still cannot thank you enough for what you have done for us, and as I have said so many times since I’ve been back home again, I would never be able to recreate the feeling I had seeing Miss Angela Lansbury onstage for the very first time, and nothing will ever hold a candle to the magic I felt that night! I know last night must have been a pretty special night, as well as emotional, and I will definitely miss Angela onstage too.